Calling attention to prostate cancer is important to us because we can act to help the more than 233,000 men in the U.S. who will be diagnosed this year. Awareness is one of the most important factors in catching prostate cancer in its first stages. This common form of cancer could be affecting those closest to us, which is why we need to inform others about risk factors, symptoms, and screenings. Prostate cancer is treatable and beatable! If the cancer is diagnosed at an early stage and can be contained to the prostate, the five-year survival rate is nearly 100 percent. Raise awareness of the second most common form of cancer for men in the United States. Honor the memory of those who have lost their lives to the disease. Encourage men between the ages of 40 and 50 to talk to their doctor about getting screened. Contribute to a future that is free of prostate cancer. 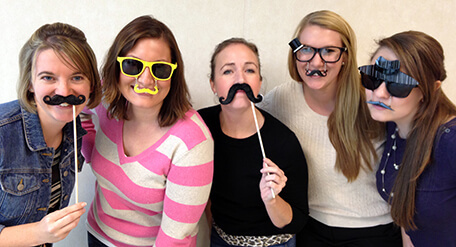 If you have your own ‘stache photos, we want to see them! Send them to us on Twitter @CookUro, or on Cook Medical’s Facebook page, or e-mail us at socialmedia@cookmedical.com.